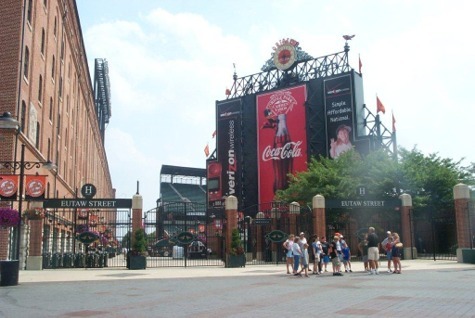 After leaving RFK Stadium, I headed further north to Orioles Park at Camden Yards in Baltimore. I got there in plenty of time to visit the shrine for Baltimore’s and baseballs biggest all-time great. I am of course talking about Babe Ruth. The Bambino was born practically around the corner from Camden Yards, and his father even allegedly owned a saloon on the site where the stadium’s center field now sits. The house he was born within is now known as the Babe Ruth Birthplace & Museum. The house itself was to be demolished, but Hirsch Goldberg, the Press Secretary to the Mayor, saved it in the early 70s. It opened in 1974 as a National shrine, became the official museum of the Orioles in 1983 and added the Colts history in 1985. It was very easy to find the Museum from the entrance of Camden Yards. All I had to do was follow the trail of 60 Baseballs displayed on the sidewalks and streets that led from Camden Yards directly to the museum. I thought this was a great way to memorialize Ruth’s incredible 60 home run season and get you to this fabulous shrine. The only tough part was that I had to park far away by the Raven’s football stadium. 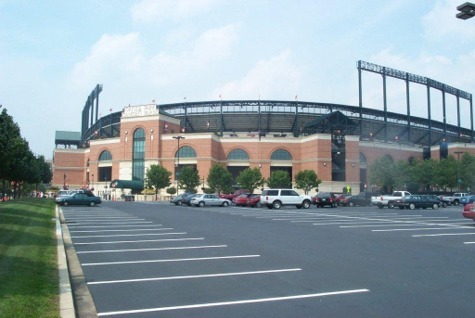 The parking near Camden Yards (and Babe Ruth Museum) is for season ticket holders only, so everyone else has to park by the football stadium and take a long walk. The good part was that you get a look at the football stadium and the Statue of Legendary Colt Johnny Unitas. The museum itself is in a beautiful brick building. Like the Ty Cobb Museum, there is plenty of memorabilia, in the form of pictures, clothes, writings, and equipment from throughout Babe’s life. 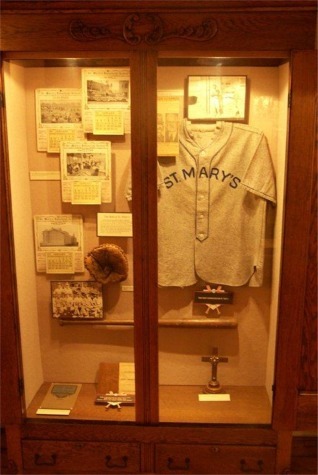 Of note is a St Mary’s uniform shirt from his youth. There is plenty of information on his historic records and feats during his amazing career as a pitcher and everyday player. The more I read and see exhibits on Babe Ruth, the more I am amazed at what he accomplished during his career. Considering that this is not just a Ruth museum, there is also an interesting Johnny Unitas wing of the museum as well as other baseball and Baltimore sports exhibits that are worth viewing. I definitely think it is worth taking a trip to this museum on any visit to Camden Yards. Speaking of Camden Yards, I headed back past the Ruth baseballs on the sidewalks and back to the main entrance of the stadium. My first order of business was to pick up my roving ticket credential. I did not have an actual seat for the game, but I did have access to all seating areas including the suite level. The most rewarding part of picking up the ticket was that the Orioles gave me a certificate for a Most Valuable Fan in ho nor of my touring this stadium as part of my big trip. I will thank Monica Pence and the Orioles again for their generosity. The place I picked up my ticket was by the main Home Plate Plaza. This is a great place to walk in. You immediately get the feel that you are walking back in time to an old stadium, even though it was only built in 1992. This was the first retro stadium built after all the cookie-cutter, dual-purpose stadiums built in the 60s, 70s, and 80s. As we all know by now, this stadium was the trendsetter for all the new stadiums built since. 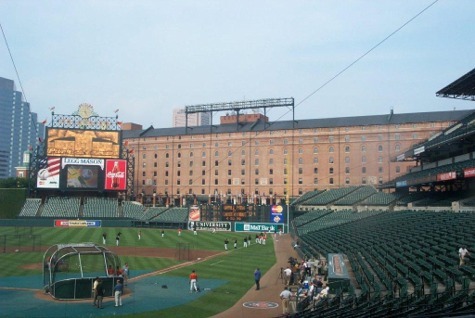 Camden Yards is located where the Camden Station of the Baltimore and Ohio (B&O) railroad used to sit. To keep the old look and feel, the Old B&O Warehouse was left standing and is now part of the ballpark for offices, shops, and restaurants along Eutaw Street. The brick exterior of the stadium is also beautiful and completely fits into the neighborhood. Some of the other new stadiums look like they tried to fit a copy of Camden Yards into their neighborhood, while Camden Yards was built to suit the neighborhood. They really got it right. Out by the main entrance, you notice the large number sculptures for the retired uniform numbers of great Orioles of the past such as Cal Ripkin (8) and Eddie Murray (33). However, the statue that stands out the most is clearly the one of Babe Ruth right out in front. From there, you can enter into the stadium through Eutaw Street, which is one of the best sections of any stadium. Eutaw Street is in between the stadium and the Warehouse and is closed off on game days to all but those with a ticket to the game. On non-game days, it is open to the public. Most importantly, it contains all the excitement and amenities of coming out to a ballpark. Boog Powell’s BBQ and Babe Ruth’s Pub are the starting point here for food, but there is plenty of other ballpark fare available here too. 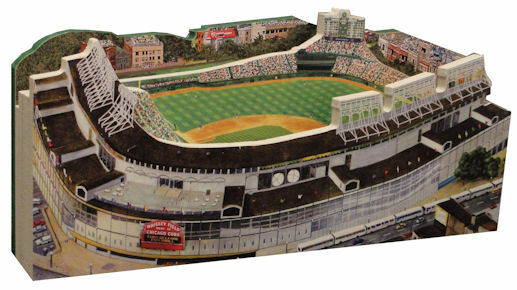 There is a beautiful mural of the stadium with a view looking out from the home plate. I had to laugh though when I came across the Orioles Hall of Fame wall, which is dedicated the Orioles, Maryland, and Mid-Atlantic Scouts. The reason I had to laugh was that it is located directly next to the Men’s room. I would have figured that is something only the Mets would do, but I was wrong. A standing-room only section can be accessed from Eutaw Street that is directly on top of the out-of-town scoreboard on the right field wall. That was the first spot that I had a view of the field from the inside (while watching batting practice). The green green seats are the first thing that jumps out of you when you enter the field. That was such a unique thing when this stadium opened. Most of the other stadiums were multi-colored or one color that is not green. This further adds to the old-stadium feel. The only non-green seats are the two orange seats to commemorate historic home runs by Orioles. The first is in section 86, which was the spot Cal Ripkin’s 278th home run as a shortstop landed. The second one is in section 96 and is where Eddie Murray hit his 500th home run. The other thing that stood out to me was looking how far away I was from both home plate (in front of me) and the wall of the B&O Warehouse (behind me). The reason that impressed me was that I now realize just how impressive it was for Ken Griffey Jr. to hit a ball off the wall during the home run derby in 1993. He is still the only player to hit the wall. From there, I took advantage of my access to the suite level and took a walk around. The Orioles use the wall space on this level to share their team’s history. There are pictures and stats of all Oriole teams going back to 1954, when they moved from St Louis (and changed their name from the Browns). There are banners along the ceilings of the concourses honoring players of the past, such as Al Bumbry and Bobby Grich, from the times I began following baseball. The lounges feature pictures of all the Oriole players that have won Cy Young, Gold Glove, and Silver Slugger awards. I particularly liked the plaque honoring Brooks Robinson, which quoted his heroic deeds for the orioles over his 23 seasons with the team. It made me think of the 1978 Topps record-breaker baseball card I have of him for playing the most years with one team. I even had the opportunity to walk into the Orioles owner, Peter Angelos, suite. This was the suite with the best view from behind the plate, but what I liked best was the big seat in the shape of an early 1900s baseball glove. Overall, I love all the Orioles history that is displayed here. It is just a shame that most fans do not have the opportunity to walk around to see it. The toughest part for me here was to decide where I wanted to sit to watch the game. The biggest part of my goal at all the stadiums I visit is to see the game. I am not interested so much from the perspective of the press, but I am for that of the fan, which is what I am (Say for the Dr. Seuss rhyme). Generally, I always prefer to sit behind the plate, regardless of how high I am, rather than be on the field level, but in the outfield with a bad angle. Therefore, I headed to the upper deck (lower section) and sat in the last row directly behind the plate. Luckily, for me, nobody showed up to take the seat I chose, but another fan named Mike (from Philadelphia) joined me to watch the game in the last row (even though that was not his seat either). The best part of this whole trip was the interaction with other people. Just telling people what I was up to, got them excited, and started many a long conversation and brief friendships for the day. I had a blast talking with Mike about baseball and my trip throughout the game. Even though my journey was mostly done on my own, I was never alone. Once I sat down to watch the game, I was able to enjoy some Oriole tradition from the start. During the Star Spangled Banner, all the fans yell “O” at the appropriate points of the song to cheer the Orioles on while partially singing the Anthem. Let’s also not forget that the Oriole “Bird” mascot was out on the field at this time and others performing all sorts of antics to get the crowd going and make little kids (and big kids) happy. The one thing I did start to notice at this point though was that the stadium was not nearly filled. 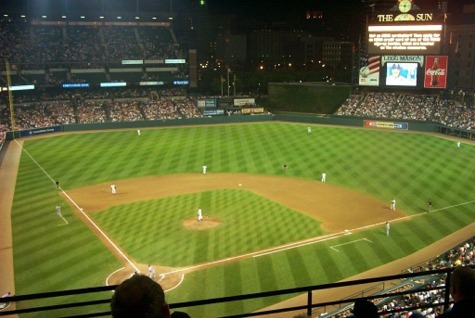 When they opened up this stadium, the Orioles sold out regularly for many years, but that is a thing of the past. The team has fallen on some hard times in the standings, and the glory of the new stadium, has apparently been outweighed by poor play on the field. Now for the game, neither team scored in the 1st, but the Rangers plated 2 runs in the top of the 2nd. Doug Glanville led off the inning with a single, moved to second on Marcus Thames walk, and scored on Einar Diaz RBI single. Michael Young then knocked in Marcus Thames with a single to give the Rangers their 2-0 lead. In the bottom of the 2nd, Rangers right fielder, Lance Nix, made the first of his 2 spectacular catches. He robbed Jay Gibbons of an extra base hit while simultaneously catching the ball and crashing into Glanville. He followed that up in the 3rd with a diving catch of a ball hit by Deivi Cruz. However, the Orioles did get on the board in the 3rd anyway with a leadoff homer by BJ Surhoff. Orioles’ starter Pat Hentgen would not be scored upon the rest of the way. He pitched 6.1 innings, while allowing only those two runs in the 2nd, also striking out 6 Rangers along the way. Although Rangers Starter RA Dickey pitched well too, he gave up two more runs in the 4th on an RBI groundout by Jeff Conine and an RBI single by Jay Gibbons to end all scoring for the game. Other than the Orioles loading up the bases on an Einar Diaz double, and Brooks Fordyce and Brian Roberts being hit by pitches, there was not even much of a scoring threat the rest of the way. The only notable thing after the 4th inning was that the Orioles played “Thank God I’m a Country Boy” as their 7th inning song after Take Me Out to the Ball Game. I never quite thought of Baltimore as the South, but I guess it is close enough to (or at) the Mason-Dixon Line to warrant it. The other thing I did notice before the Orioles brought in Jorge Julio to close out the game in the 9th was that the bullpens are stacked right on top of each other. I never saw that before, and later learned that it was the first stadium designed that way. Even though there was not a lot of scoring in the game, it was a good pitchers duel with a few great defensive plays to boot. I had a good time hanging with Mike during the game too. A fterwards, on my walk towards the car, I stopped outside the stadium to see their tribute to Memorial Stadium, where the Orioles played from 1954 through 1991. It was named Memorial Stadium after the soldiers that died during World Wars I and II. Because of this, the stadium was not demolished until 2001 due to community backlash on destroying the memorial for the soldiers. 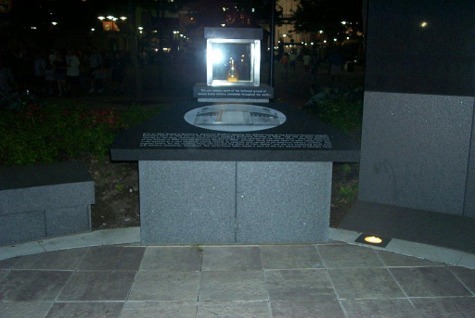 They eventually decided to build a memorial wall outside of Camden Yards using the stainless steel letters from the original stadium that formed the large memorial. Due to the size of the original letters, the only portion that is still displayed is “Time Will Not Dim the Glory of Their Deeds” There is also a plaque and photo of Memorial Park alongside the Memorial wall. I am glad that this display is there for all to see and remember the old stadium and more importantly those that gave their lives in the World Wars. Now off to Philly and my favorite baseball story on the trip. 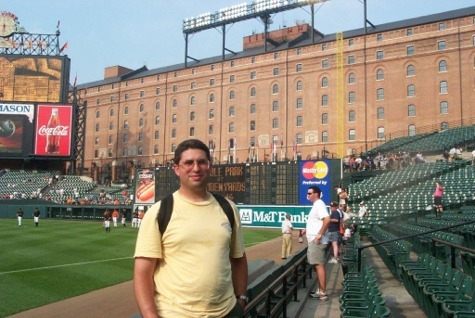 Bottom line – Camden Yards is clearly one of the highlights on my trip. There is a lot of hype around this stadium being the first of the new-old stadiums, and I have to say that it lives up to the hype. Every baseball fan should come to see at least one game here.